E-Stalking? Get Celebrities to Follow you on Twitter! What would you do to have some of your favorite celebrities follow you on twitter? How far would you go? Would take a burger to your face to do that? Would you just make a video and look funny in it? Well this guy did. 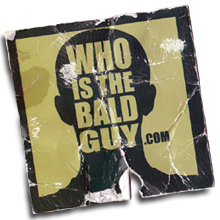 Meet Mr. Whoisthebaldguy who is one determined person who intends to get his favorite celebrities to follow him. Talk about E-stalking! While Whoisthebaldguy is his twitter account his real name is Michael Krivicka. Michael has decided to come up with the most creative ways to actually amuse and make stars follow him. Michael began to make personalized websites and videos asking stars to follow him. And it seems its working, Michael has already being followed by Ellen DeGeneres to follow him on Twitter. He got this possible by making a simple hand-drawn animation piece for her. That was just the beginning. Michael already has sites such as jimmyfallonpleasefollowmeontwitter.com and ashtonkutcheryoushouldtotallyfollowmeontwitter.com and last but not the least alyssamilanopleasefollowmeontwitter.com. If any of the stars choose to follow him he then makes them a personalized “thank you” YouTube video. Its not new that he did not have any copy cats trying to copy what he was doing however he made this video to counter that. E-Stalking at its best 🙂 You can visit his site here, and his Twitter page here. You can visit his other celeb sites here – Ashton Kutcher, Alyssa Milano, Jimmy Fallon.